After delving into the research on berberine for diabetes, it really is quite amazing to see it's potential to help control blood sugar levels as effectively as metformin and other medications. To confirm the research-based benefits of berberine in clinical practice, I spoke to two physicians about berberine, Dr. Ralph Esposito, Naturopathic Physician and Licensed Acupuncturist, and Dr. Mona Morstein, Naturopathic Physician and Author. Right out of the gate, Dr. Esposito shares that he prescribes berberine to his patients on a regular basis. So too does Dr. Morstein. Of course, no supplement routine is going to perform miracles without adherence to a great nutrition program. But when nutritional changes and berberine are combined, “I find these two combinations work exceptionally well and most of my patients are eventually able to get off most of their medications for diabetes,” says Dr. Esposito. And as already suggested above, berberine has even been shown to outperform several medications. Curious to learn more? Keep on reading as we explore berberine in detail. Berberine is a bitter substance so it's best take in capsule form. Berberine is a compound originally extracted from the Chinese herb – coptis chinensis (Huanglian). But according to Dr. Morstein, it can be found in many different botanicals: Barberry, Oregon Grape, Goldenseal, Chinese goldthread, California poppy, and others. Even though berberine may be new to you, it has been around for a long time – being used in folk medicine, along with traditional Chinese, Indian and Middle-Eastern medicine for over 400 years. And of course, the most interesting benefit to you as a person with type 2 diabetes or prediabetes, is berberines’ ability to help improve blood glucose control. Quite amazingly, berberine has been shown to help control blood sugar levels as effectively as metformin – one of the most widely-prescribed diabetes drugs worldwide. Researchers compared the glucose-lowering effects of berberine and metformin in newly diagnosed adults with type 2 diabetes, over the course of 13 weeks. The randomized groups were given either 500 mg of berberine per day, 3 times per day, or 500 mg metformin, 3 times per day after meals. If people experienced any gastrointestinal side effects from the berberine, their dosage was reduced to 300 mg, 3 times per day. The results at the conclusion of the study showed that the glucose-lowering effect of berberine was highly similar to that of metformin. And in fact, outperforming it for A1c reduction! 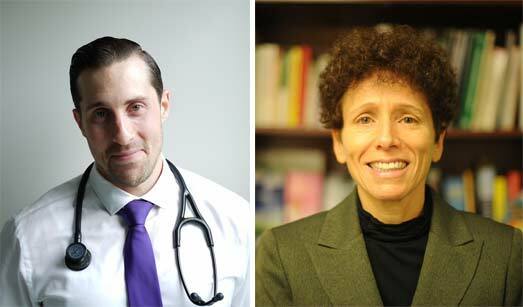 “This study of berberine against metformin at equal doses was very impressive, with berberine lowering A1C by 2%, which is higher than any conventional oral hypoglycemics have been shown to lower A1C in the same time,” says Dr. Morstein. The same study also set a secondary study with combination therapy, adding 500 mg of berberine alongside metformin for an additional 5 weeks. Fasting blood glucose showed a dramatic reduction and A1c reduced by 0.8%. Berberine vs metformin – 500 mg per day, 3 times per day berberine vs 0.75 g metformin – no difference in fasting blood glucose and A1c – meaning they performed the same. Berberine vs rosiglitazone – Two clinical trials demonstrated that berberine performs better than the medication rosiglitazone for lowering fasting blood glucose, with no difference between the two for A1c reductions. Berberine vs glipizide – no significant difference in the fasting blood glucose outcomes for groups. Berberine + metformin vs metformin – 5 trials have demonstrated combination therapy improves fasting blood glucose and A1c more than using metformin alone. Berberine + glipizide vs glipizide – one trial has shown that combo therapy may be more beneficial for lowering postprandial blood glucose. To help get your head around how berberine works, let’s do a quick recap of insulin and insulin resistance. 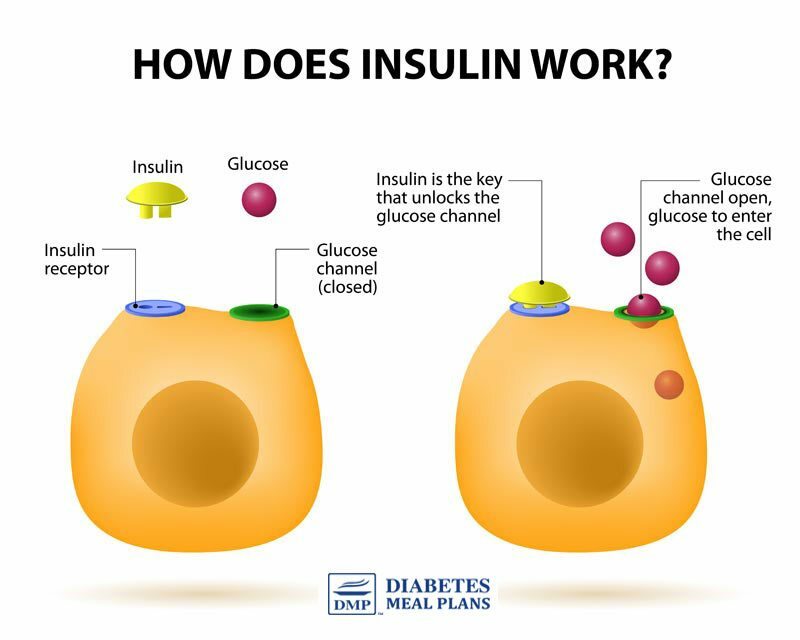 Insulin is the hormone produced by your pancreas that is needed to help glucose (sugar) move out of your bloodstream and into the cells (such as muscle and liver cells). On the outside of cells lies ‘insulin receptors' and under normal circumstances, insulin acts as the key to unlock the cells so that clearing of the bloodstream can occur. There's just one problem: when you have type 2 diabetes and prediabetes, chances are you have insulin resistance. This means insulin does not unlock the door. Your cells don't respond. Another important thing to recognize is it’s not just the pancreas and insulin involved here. Your liver plays a critical role in insulin resistance, along with energy metabolism as well. “In Western botanical medicine, berberine is considered an “alterative,” that is, an herb that helps support the functioning and health of the liver, and the production and secretion of bile. The liver is a key organ for insulin resistance, and most obese patients have fatty liver. Therefore, supporting liver health and functioning is an added bonus to using berberine,” adds Dr. Morstein. Indeed, research on liver cells shows that berberine increases the expression of insulin receptors by as much as 40%, making them more sensitive to insulin so they can unlock those cell doors. Similarly, berberine also improves insulin sensitivity in muscle cells, increasing the activity of glucose transporters, and therefore improving overall glucose metabolism. Additionally, berberine alters glucose metabolism by stimulating glycolysis – a pathway of nutrient metabolism that can become disrupted in diabetes and prediabetes. Glycolysis is the pathway that assists with utilizing and storing glucose in the body. Another function of berberine is it suppresses gluconeogenesis, the production of glucose in the liver. If you have high morning blood sugar levels, this is often the result of gluconeogenesis – your liver producing glucose, along with your body's lack of ability to hormonally counteract/control these effects. 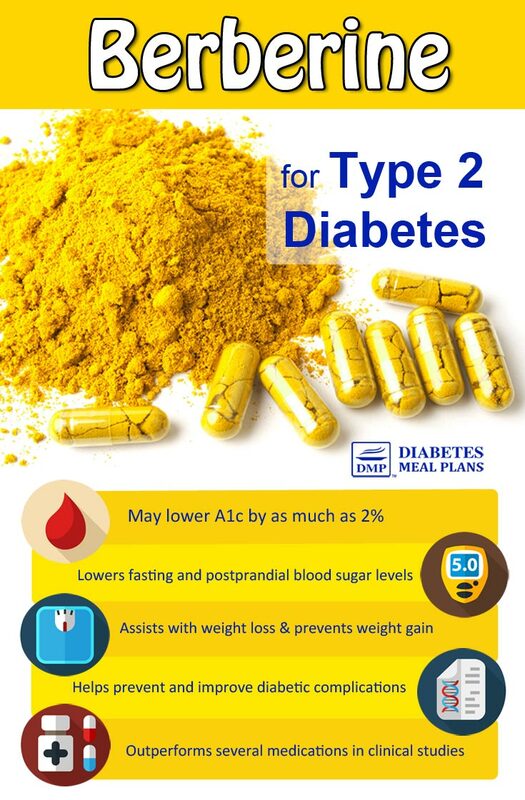 In any case, the results of studies clearly show that berberine could be a beneficial inclusion to your diabetes or prediabetes treatment plan, either in solo or as a combo therapy alongside the medications you already take. Yes, that’s right. You can even take it alongside medications you already take, as the studies above showed. And these effects are being seen in real life scenarios. “Oftentimes my diabetic patients are already taking prescription medications for their diabetes,” says Dr. Esposito. “I have seen berberine work exceptionally well alone, and I often begin first with berberine capsules and nutritional therapy. If those are not providing benefit, I find berberine to work well with Metformin as well. Generally berberine is safe and effective with other diabetic drugs,” he says. Of course, it’s always recommended to work with your doctor if you’re considering taking any supplements, especially if you currently take medications. Please pin, tweet or share; then keep reading about it's other benefits below. As already indicated above, the influence of berberine doesn’t stop at better blood glucose control. In terms of weight, berberine helps prevent fat deposits by influencing cellular regulators of fat accumulation, and by downgrading inflammation – a known driver of obesity. In a 12 week study in obese adults, 500 mg of berberine 3 times per day produced a modest weight loss of 5 pounds (2.2 kg). Another study in men and women with metabolic syndrome, given 300 mg of berberine 3 times per day for 3 months, showed an improvement in Body Mass Index (BMI), along with a reduction in belly fat. In terms of cholesterol improvements, researchers suggest berberine helps stabilize the low-density lipoprotein receptor (LDLR) messenger RNA – yes, very scientific but important because these mechanisms assist the body to regulate cholesterol more efficiently. One study in rats found that combining berberine with the cholesterol lowering drug known as simvastatin (a statin) improved the cholesterol-lowering effect of the drug and produced a 31.8% reduction in LDL cholesterol, which was more effective than either of the therapies used alone, producing an average 28% reduction. The researchers then went on to test these effects in hypercholesterolemic patients and also found a positive result – the combo therapy produced a 31.8% reduction in LDL cholesterol. A review of several clinical trials confirms that taking berberine alone was more effective than taking lipid lowering drugs. And not surprisingly, taking lipid lowering drugs + berberine was more effective than taking lipid lowering drugs on their own. The development of many of the associated diabetic complications is due to endothelial dysfunction, or in other words, damage to the lining of the blood vessels in your body. This includes complications such as cardiovascular disease, neuropathy, and nephropathy. Berberine has been shown to improve entdothelial function, which subsequently reduces risk of damage and may even restore function on various levels. In terms of heart disease, lowering cholesterol and blood glucose protects you. And we already know berberine can help with that. But additionally, researchers suggest berberine directly protects the cardiovascular system by directly modulating sympathetic heart activity – this basically means there is some influence on the bodies sympathetic nervous system. And in rats, this effect has been shown to reduce the impact of heart attacks. In rats, berberine has been shown to improve renal function in nephropathy. And nerve conductivity in neuropathy. One of Dr. Esposito’s areas of specialization in clinical practice is helping men overcome erectile dysfunction in diabetes – yes urological issues are a complication of diabetes. 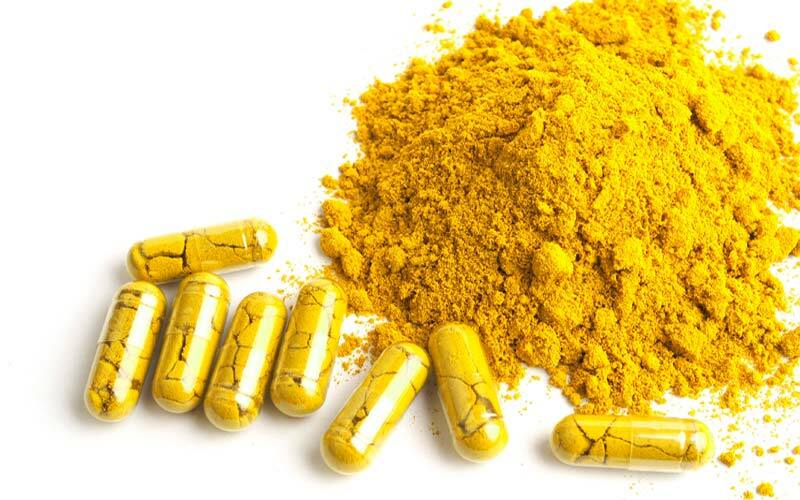 He suggests that his patients see great improvements when taking berberine accompanied by lifestyle changes, saying they usually come off any medications they are taking for the condition. “People with high glucose levels have decreased immune system functioning, so boosting immune protection by way of altering gut bacteria is another benefit of berberine. Berberine is an anti-inflammatory agent as well. It can lower inflammatory molecules that promote insulin resistance, steatohepatitis, and depression,” adds Dr. Morstein. Possible side effects include gastrointestinal problems such as constipation, stomach cramps, nausea and diarrhea. “I always recommend people eat their meal and then take any product with berberine in it; that usually helps a lot with tolerance to it,” advises Dr. Morstein. Berberine can also interact with a certain class of antibiotics called macrolide antibiotics. Berberine should not be used by pregnant or breastfeeding women. Most studies suggest a dosage recommendation of 3 separate doses of 500 mg of berberine daily. Or if you experience stomach upset, a reduced amount of 300 mg 3 times per day. Both Dr. Morstein and Esposito confirm that this the dosage used in clinical practice to produce effective results with their patients. When you regain good control, you should be able to come off supplements, just as you do with medications. However, both doctors also agree that taking berberine long term is safe and preventative if necessary. Just be aware, “berberine is very, very bitter so taking it in capsules is best, vs. herbal tinctures, or even worse, a tea,” informs Dr. Morstein. And remember, supplements are there to provide assistance but are best used in conjunction with diet and lifestyle changes. Please pin, tweet or share this info to help others – thanks! There is no true “cure” for reversing diabetes from a diagnosis stand point. However, berberine can certainly be one piece of your treatment plan that helps bring your levels back to normal range– but you will need to pair it with a healthy diet and plenty of exercise. Make sure to check with your doctor prior to starting any new supplements. I have been recently diagnosed as Type 2 diabetes. I am taking Trulicity , can I use Berberine in conjunction with Trulicity. I also have severe acid reflux and heartburn, and have had stomach issues since my 20’s and have been diagnosed with IBS. You’ll need to check with your doctor, Vicci. He or she will need to take all of that into account prior to making a recommendation on the berberine. I was diagnosed with high blood sugar. My numbers were right at the diabetic level. My doctor gave me 3 months to try and lower it on my own. I researched supplements and found an article for Berberine. I took 500 mg Berberine every day with a low carb diet and dropped my blood sugar numbers to normal. My liver numbers were also elevated and those numbers returned to normal at the end of the 3 months. YES, fantastic isn’t it Rachelle. Berberine works effectively for many people. Try dropping your sugar, grains and white potatoes. It worked miracles for my blood sugars. Is berberine at all effective on high blood pressure? I am a type 2 diabetic who has finally brought my blood sugar, cholesterol, triglycerides down to near normal after many years of struggling with it. But the blood pressure has now gone up higher than it has ever been. Still working with doctor. Was on Lisinopril 5 mg for a year (and even that dose brought bp too low sometimes). Then bp started to go up. Was switched to Losartan and increased it to 100 mg and it still wasn’t working. Back to Lisinopril and now on 40mg and it’s only helping a little. I want to be so happy about the other lower numbers, and most especially my energy coming back after being so fatigued since 2012. It’s very perplexing. I read about berberine from Dr. Mercola, and he does say it can lower bp. Do you agree? Hi Karen, during the course of our research we did not find a ton of strong evidence to support the use of berberine for hypertension (high blood pressure.) There are a lot of great animal studies coming out, which may mean promising things as far as future research, but I do believe we need to see a little bit more evidence before making the claim that berberine lowers blood pressure. Check out this article on blood pressure which includes a few dietary suggestions as well as some additional supplements you may want to consider. Is berberine effective for someone on both Metformin and insulin? As you read in the article, berberine is very effective for many. The one caution is that you need to check with your doctor, because you are on medication your doctor may need to adjust your medication so that your blood sugar doesn’t drop too low. Do not attempt to adjust on your own! We do not promote a particular brand, so whichever is most easily accessible for you is a perfect choice. As mentioned in the article, the taste of berberine can be very strong, so picking a capsule will be better tolerated compared to a tincture or tea. Do you think i should try Berberine? John, it’s always recommended to check with your doctor if you’re considering taking any supplements! Through a combination of diet, exercise, and possibly medication and/or supplements your goal is to maintain a near normal A1c level, ideally under 6%. Thanks for all the wonderful information. I’ve really learnt a lot by reading your articles. I will appreciate it if you could please comment on coconut water for type 2 diabetics. What is its effect on glucose levels in the body? Is it ok for diabetics to consume? Thanks. For some, coconut water can be included as part of a healthy diabetic diet. You need to check the nutrition label carefully and make sure it pure 100% coconut water, without any added sugar. In small amounts it may have some benefits. We’ve previously written an article about coconut water which you may find interesting! A very in depth article and I’ve learned a lot about how berberine can help lower my high bs counts in the morning. Thank you so much for your on going educational info on how to take care of blood sugar levels and so many other conditions that affect many people! can it be used in conjunction with metformin? Yes berberine can be used in conjunction with metformin, if you read above, studies show that when taken with other meds like metformin, it enhances the outcomes for people. Just be aware it’s important to inform your healthcare team that you are taking this supplement and be aware of monitoring your levels. Since they are both effective at lowering blood sugar levels, the combination of the two could lead to hypoglycemia (blood sugar levels that are lower than ideal) in some. I am hypoglycemic with fairly good numbers. My A1c is 4.7. Would Berberine be a bad idea for someone like me? I have been experiencing insulin resistant symptoms as well, and hoped that Berberine might be the answer. However, if it only lowers and doesn’t Addapt the blood sugar, I could see this being a problem. Most research I’ve read has not answered this question. What do you think? Hi M. Since berberine is a highly effective blood sugar-lowering agent, it is not suitable for a person who is hypoglycemic. Do you have any recommendations for brands of Berberine? I would like to try it, and want to choose a high quality supplement.